These plants are amazing and a great way to decorate my gardens when they are in bloom! These flowers are bright and colorful. Planted them last year and they practically doubled this year in numbers. Plants looked questionable when received. But this season I am impressed with the bloom. Got these for my mother last year. She loved them. They bloomed like crazy this year!! Blue Flag iris - Iris versicolor. Blue Flag Iris has a lot of uses. Blue Flag iris plant can be used to cleanse the blood of contaminants and can also as well be used to treat certain skin disorders. When Blue Flag Iris is created into a paste, it also helps bruises disappear and heal small wounds. The Blue Flag Iris is also used in oils and capsules to combat certain sexually transmitted diseases. Blue Flag Iris will be beautiful when added to water gardens. Blue Flag Iris will usually do well in moist soil conditions. 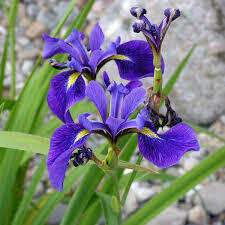 The Blue Flag iris flower will be attractive as it gives a gorgeous purple bloom. They also look well in a vase with other cut fresh flowers to create a beautiful arrangement for indoors. These flowers are beautiful when there are a bunch of them planted together, and they all bloom. They provide lots of color to all gardens and also bring in butterflies and bees to the location. Blue Flag iris are great because they are very easy to grow, and they come back every year. These flowers produce bulbs and grow back thick each year. They can also be separated once they died out and planted in other locations throughout a lawn or garden. Once they stop blooming, they can be cut back, so they are ready to grow the next year. These supply a beautiful shade of bluish purple when they are in bloom. This flower usually blooms during the spring months of the year. These are a great way to brighten up all gardens and also works great as a bordering flower for sidewalks and driveways. They can be seen growing wild around bodies of water where the soils are just right for them, and they can also be found growing in meadows.